This healthy slow-cooker veggie lasagna only takes 15 minutes to prep, and then your work is done! You’ll come back and find layers of warm, cheesy noodles waiting for you. I’m definitely a morning person, so it would make sense if my favorite time of the day was in the morning…but it’s actually the 6:00-8:00 pm-ish window. I call it my “exhale” time of the day. That’s when I usually get home for the day, drop my heavy backpack, sit down for a cozy dinner, and feel happy to relax for a bit after a (hopefully) productive day. 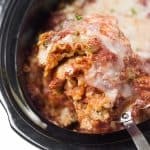 In high school, I especially loved this time of the day because I’d walk in the door after a long day of school and cross country or track practice and could count on my mom to be making a delicious, hearty meal like baked ziti or lasagna. Ahh, those were the days. It isn’t quite the same when I’m coming home to an empty, small, dark dorm room. On its best days, it feel like a cave, and honestly, on its worst days, it feels like a small dungeon. BUT, I still love this time of the day. …Like this healthy slow-cooker veggie lasagna. It feels appropriate to share this recipe today since I drove home yesterday for Christmas break, and lasagna is such a “home” food for me. BUT luckily, this version is easy enough to make in college if you have a slow-cooker. 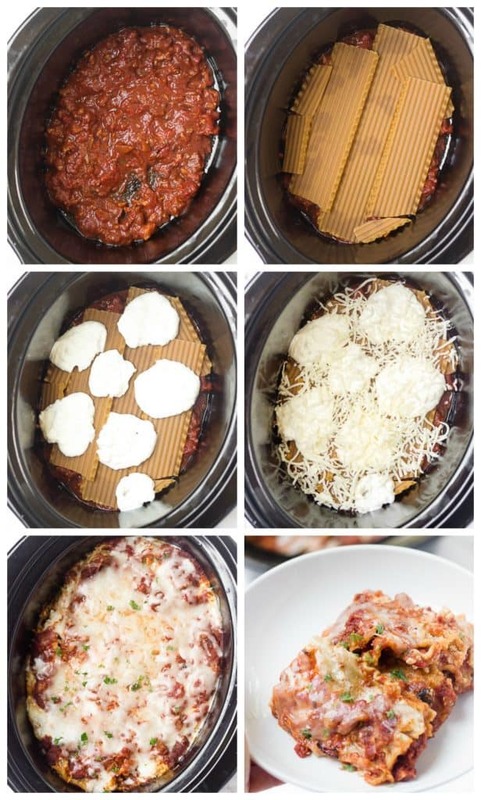 Things I love about this recipe: it requires less hands-on time and fewer pots & pans than regular oven-baked lasagna since you don’t have to cook the noodles beforehand. ???? I also toss in some uncooked mushrooms and diced bell pepper for some extra veggies with dinner, and they cook perfectly along with the noodles! I like both ricotta and cottage cheese but tend to use cottage cheese for this recipe since it’s higher in protein. And I have a little trick to make cottage cheese a similar texture to ricotta: just blend it up! It gets really smooth and creamy and it’s high in protein. Here’s what you do: Blend the cottage cheese up with one egg and the Parmesan cheese to make this awesome, really creamy cheese mixture. Then, spray the bottom and sides of the slow-cooker with cooking spray. Layer 1/4 of the sauce, 3 noodles, 1/4 of the cottage cheese mixture, 1/4 of the mozzarella cheese…and then repeat 3 more times for a total of 4 layers. You may need to break some of the noodles up to fit in your slow-cooker. Then, just pop the lid on your slow-cooker, and your work is done! The first time I make any slow-cooker recipe, I like to check it early since slow-cookers vary in power and my LOW setting may be really different from the person who wrote the recipe. So, while I suggest cooking this on LOW for 3-4 hours, I’d plan to check it around 2.5-3 hours the first time you make it in case you have an extra powerful slow-cooker…because who likes mushy noodles? Like regular lasagna, you can eat it right away and it’ll be a little messy (as pictured), or you can remove the lid and let it set for 20 minutes or so and it’ll be a bit neater. 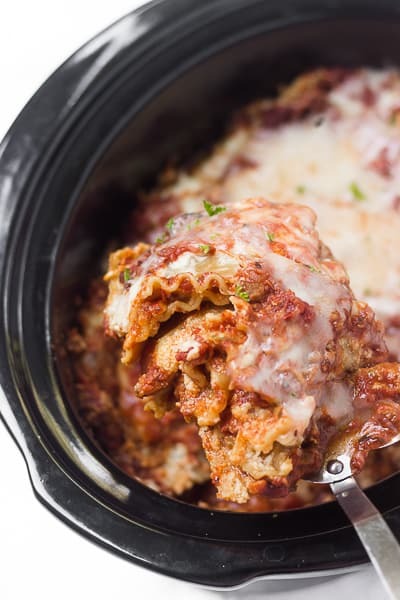 Hope you LOVE this easy slow-cooker veggie lasagna! If you try this slow-cooker veggie lasagna, feel free to let me know in a comment or tag me @livbane on Instagram! Place cottage cheese, parmesan cheese, and egg in blender and blend until smooth and creamy. Spray slow-cooker with cooking spray and spread 3/4 cup sauce on the bottom. Add optional 1/2 cup chopped veggies and then 3 lasagna noodles, breaking in half if necessary to fit. 1/2 cup cottage cheese mixture and then 1/4 cup mozzarella cheese. Repeat this process until you have four layers. Place lid on slow-cooker and cook on low for 3-4 hours until your noodles are al dente (depending on your slow-cooker). The first time you make this, check at 3 hours and note how long it takes in your specific slow-cooker. Thanks, Abbey! Love my slow-cooker! YUM! I was just looking for some easy meals while we have friends in town! Can’t wait to try this! Hope you love it, Mikki! 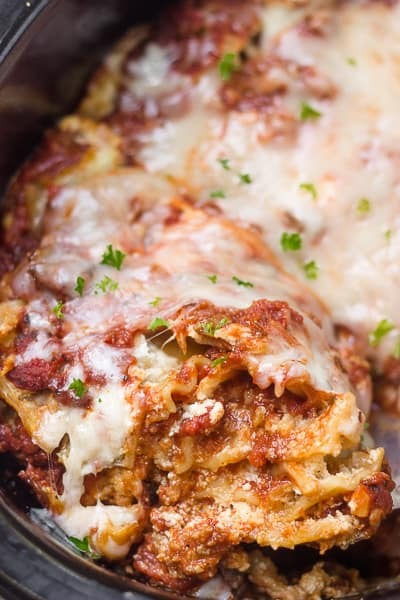 This veggie lasagna looks so delicious! So easy to make too! Perfect for a busy weeknight dinner. Just put everything in the slow cooker and let it go! Yes!! Love that there’s no prep work beforehand. Just put everything in the slow-cooker and all of your work is done. Ooh, this recipe looks so easy – and so delicious! I totally need to try it out!